During the days of Sri Ramanujacharya in Srirangam Ranganatha Swamy Temple, there was a poor hungry man. Like Kuchela he had many children. This simple man used to go out for alms. Sometimes he would get plenty for all the family to eat and on some occasions he would get very little and the children only will be fed. The parents would remain without eating. 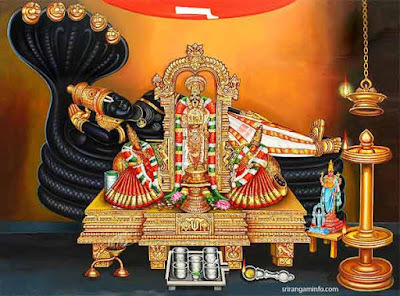 He had very great faith in Srirangam Ranganatha and would worship him daily, and used to visit Sri Ramanujacharya’s mutt to have his darshan and remain contented. It is however difficult to expect his many children to have the same attitude. They remained a crowd of hungry children. The children used to visit the temple during puja time and whatever prasadam (temple food) was given, they used to grab them. When these children came, it was a problem for the man distributing the prasadam. The children used to trouble him much. It was so annoying that the temple servants, one day reported the matter to Ramanujacharya. Ramanujacharya called the father of the naught children and advised him to live far away from the temple so that the children will not trouble the temple servant. He assured him that Lord Ranganatha in his infinite mercy will help him in every way. The father accepted the advice hoping that the Lord will certainly protect him and his family in deference to the words of Ramanujacharya. He accordingly shifted his residence one day and lived in the north of Kaveri region. He decided not to go to the temple and the children were also advised not to attend the temple for any reason. In the night, he was surprised to find a temple servant of the temple bringing for him sufficient quantity of Prasad. In other words Lord Ranganatha himself in the form of a temple servant did the work to satisfy the wishes of Ramanujacharya. So went on affairs for a few days. In the meantime, the temple servants found that a portion of the prasad offered to the Lord, disappeared and they were at their wit’s end to find the truth. Not knowing how best to solve the problem, they rushed to the great acharya and explained to him the position. Sri Ramanujacharya immediately thought of the poor man to him he gave advice a few days back, and wanted to know where he lived. A disciple of Acharya recalled how he saw the children of the poor man plying in a garden in the north Kaveri region. Acharya himself personally went to see the man. He found him in meditation. He called him and enquired of him about his welfare. The man fell at the feet of Ramanujacharya and told how he got prasad from Lord Ranganatha daily from the day he was advised to live far away. He was rejoiced and said he was quite happy with his family and it was all due to the Acharya’s mercy and conveyed his sincere gratitude. Sri Ramanujacharya paused for a moment and thought of Ranganatha’s mercy in honoring the words of advice given to the man and wad deeply touched. Source - Saptagiri Magazine December 1986.